I love to read, and I wish I had time to read more. I’m always curious about what others are reading and why. Some books are entertaining. Some, I quickly forget or don’t finish reading at all. Other books make a lasting impact on my life. I find myself going back to these books over and over again. 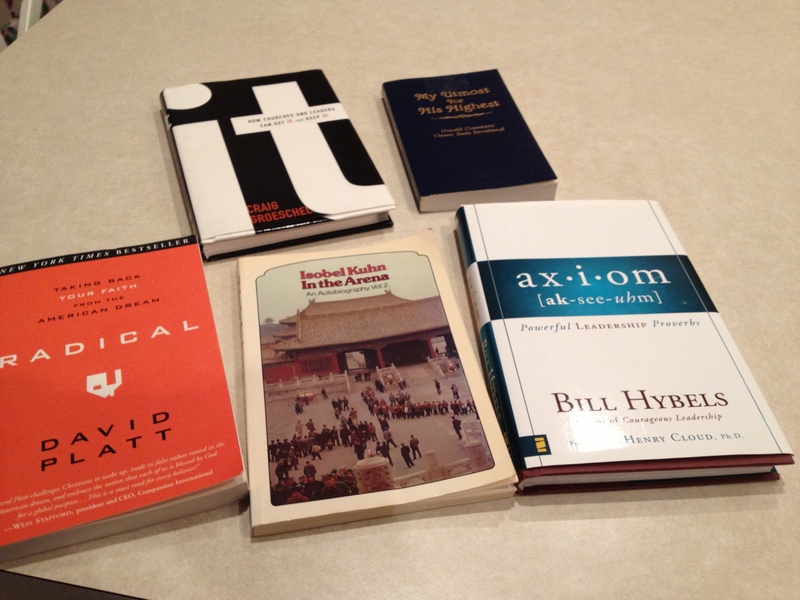 So, here is my list of ten books that have greatly impacted my life and why. I heard Bill Hybels share some of his leadership axioms at the same Leadership Summit that year. These axioms are packed with powerful nuggets of truth and wisdom. This book is great for anyone in leadership. This is actually the second part of a two-part autobiography by Isobel Kuhn, a missionary who served in China. Her transparency and willingness to share her struggles in serving the Lord draw me back again and again to this book. I can so identify with her, and this book gives me great hope as I struggle with my own inadequacies. Prof Hendricks was one of my professors at Dallas Seminary. He completely changed the way I teach. I will never forget his words, “The goal of teaching is not to impart knowledge but to change lives.” This book gives seven principles to apply in teaching others in any setting. This is one of my favorite devotional books. No matter how many times I read it, something new always stirs my heart. This book challenged me to step back and evaluate my Christian life. Have I gotten complacent? Am I stepping out in faith, trusting God to do what only He can do? A word of caution: Don’t read this book if you’re not ready for God to shake up your life. I love all of Francine Rivers’ books, but this one is my favorite. She gives a beautiful picture of God’s love for us through a modernized story of the book of Hosea. Life just seems to get busier and busier and we don’t know how to slow down and take a day of rest anymore. This book helped me see the importance of embracing the gift of Sabbath rest. Okay, it’s your turn. What books have greatly impacted your life and why? Social Media: A Blessing or Curse?